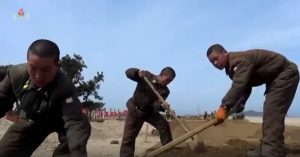 There has been a rise in the number of North Koreans paying others to take their place in mandatory state-led construction projects, sources in the country report. 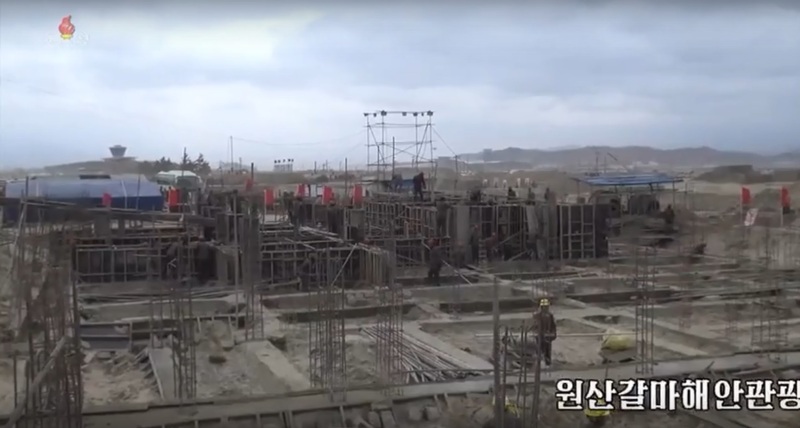 Generally speaking, enterprises, the Korean Socialist Women’s Alliance and Kim Il Sung-Kim Jong Ilism Youth Alliance send workers to participate in state-led construction projects. 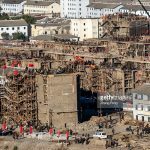 Recently, however, there have been more cases where others are sent to the construction sites instead of the designated workers, the source reported. 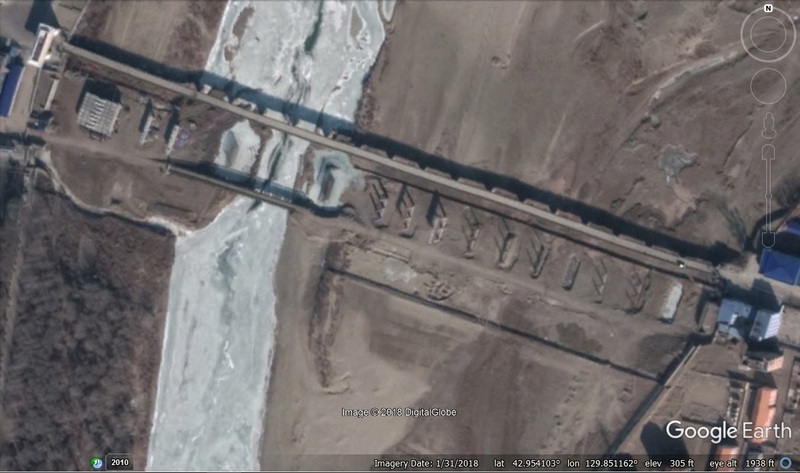 “The construction of the ‘Chongchongang Power Station in Tiers’ at the basin of the Chongchon River in South Pyongan Province is almost finished, but there are too many ‘replacement’ construction workers there,” he said. 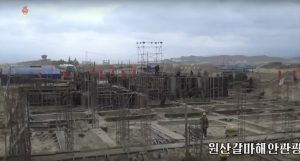 The Women’s Alliance Special Labor Brigades in Pyongsong’s Yangji District sent a total of 15-20 people to the construction site, but many of these workers are in fact replacements for others who were mobilized for the project. This suggests that North Koreans are paying more attention to their own personal lives than the fulfillment of their national duties. North Korean state media reported in November 2015 that a ceremony celebrating the start of construction on Chongchongang power plant was held at the Huiceon No. 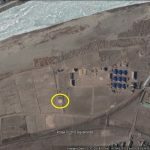 9 Power Plant, but the project has dragged on for three years due to construction problems, a separate source in South Pyongan Province. 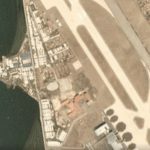 “Some have voiced concern about issues with the construction plans for the power plant, ” he said, adding that the majority of the “replacement” construction workers who are paid to work on the construction sites are said to perform unsatisfactorily. The organizations that traditionally send workers to construction sites are not fulfilling their responsibilities properly, either. The Women’s Alliance, Youth Alliance and enterprises don’t bother to check whether the right people are going to the construction sites, the source said. 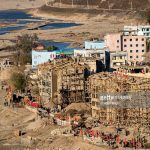 “When a replacement is sent to a construction site, they are guaranteed three days of food, along with three days of wages equaling 60 yuan, along with another 20 yuan to pay for their transportation. So in total, they receive 80 yuan,” he said. Replacement day laborers are also prevalent in North Korea’s agricultural sector, and receive three meals a day along with 20 yuan for eight hours of work. 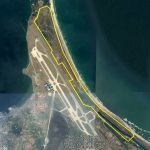 As the North Korean authorities shift the financial burden of preparing for the anniversary of North Korea’s establishment on September 9 and the development of the Wonsan-Kalma Marine Tourist Zone, residents are increasingly voicing their complaints over the inherent unfairness of the situation. 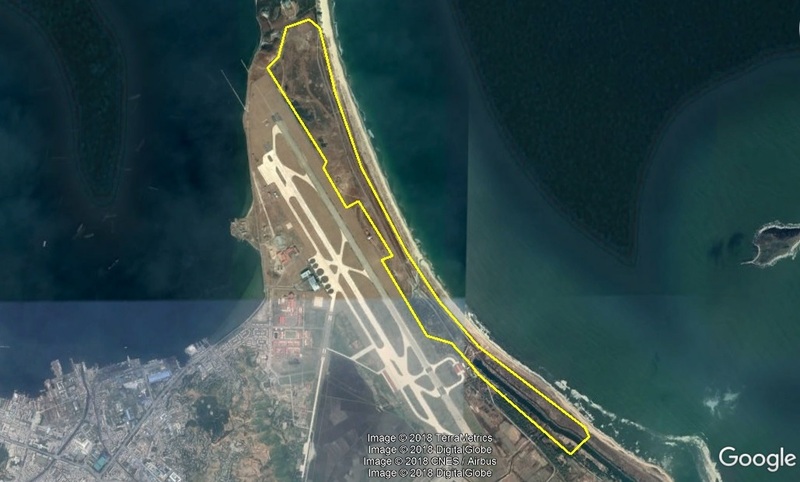 The North Korean authorities have placed great importance on the development of the Wonsan area along with events surrounding the 70th anniversary of the establishment of the nation on September 9. State officials are forcibly taking money from the pockets of ordinary citizens to pay for these projects, according to the source. 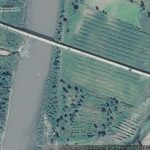 “There is money that we have traditionally given to the state each month, but now they have told us we need to give them 2,000 yuan more per month […] Business is difficult these days, which forces us to take money out of our employees’ salaries to pay state officials,” the manager of a North Korean restaurant in China’s Liaoning Province said. The manager also noted that the authorities were asking for more money to be paid at ever more frequent intervals of time. 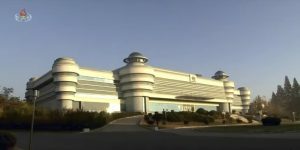 “Our employees are usually forced to give money [to the loyalty fund] each month, but our employees are up in arms about the amount taken out by the state this month,” the manager said, expressing concern that feelings of discontent among their employees could lead to them running away or even defecting to South Korea. Aside from a mention of promoting “balanced economic growth,” it’s really the only concrete measure within the economic sphere mention in the Panmunjom declaration: As a first step, the two sides agreed to adopt practical steps towards the connection and modernisation of the railways and roads on the eastern transportation corridor as well as between Seoul and Sinuiju for their utilisation. Sure, this is fairly vague too, but at least it’s something. During the talks, North Korea’s leader Kim Jong-un praised the quality of South Korea’s high-speed train system in Pyeongchang, while citing worries that if Moon were to visit the North, he would be inconvenienced since the transportation infrastructure there is much less advanced. “If (Moon) comes to the North after living in the South, it may be embarrassing. We will make preparations for a comfortable visit,” Kim said. The South Korean president responded with hopes of restarting cooperation to build a railway connecting the South and North — which the two sides had agreed on during previous inter-Korean summits, yet never put to action. In other words, it’s already being talked about by the two leaders. It’s fairly uncontroversial and not politically touchy, at least not relatively speaking. It’s not a coincidence that Putin mentioned infrastructure specifically during a phone call with Moon Jae-in about the summit. In theory, at least, it’s a potential win-win-win situation, both for North and South Korea and for other countries in the region, and therefore politically palatable. 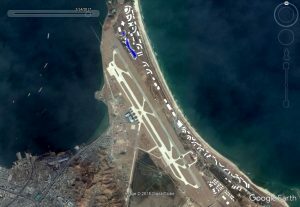 The idea of massive infrastructure projects as a way to facilitate trade, and peace, is certainly not new and has been part of the plan for inter-Korean economic exchange before, and the blueprints are too many to fully keep track of. Kim Jong-un will almost certainly be seeking support in this area, a crucial one for the second leg of Byungjin. It is one of the most iconic buildings of the Kim Jong-un era. 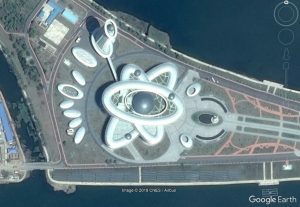 On the inside, it is an educational facility for science and technology, the development of which is a cornerstone of economic policy under Kim Jong-un. 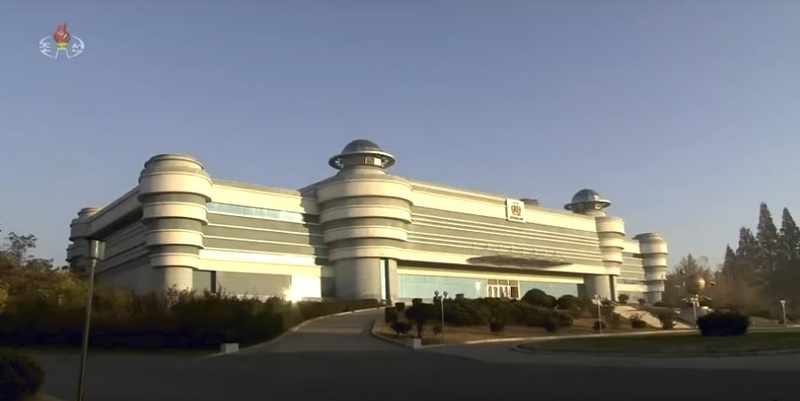 On the outside, the building (designed to look like a beryllium atom [four electrons]) is a showcase piece for the new style of design and architecture characteristic of the Kim Jong-un era. 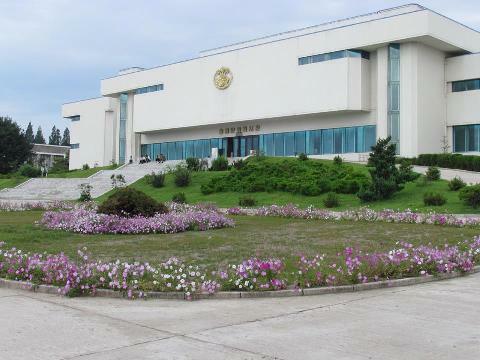 In true North Korean style, which aims to establish equality across each province, it is possible that new “Sci-Tech Libraries” (과학기술도서관), based on the model complex in Pyongyang, are being constructed in each of North Korea’s provinces. 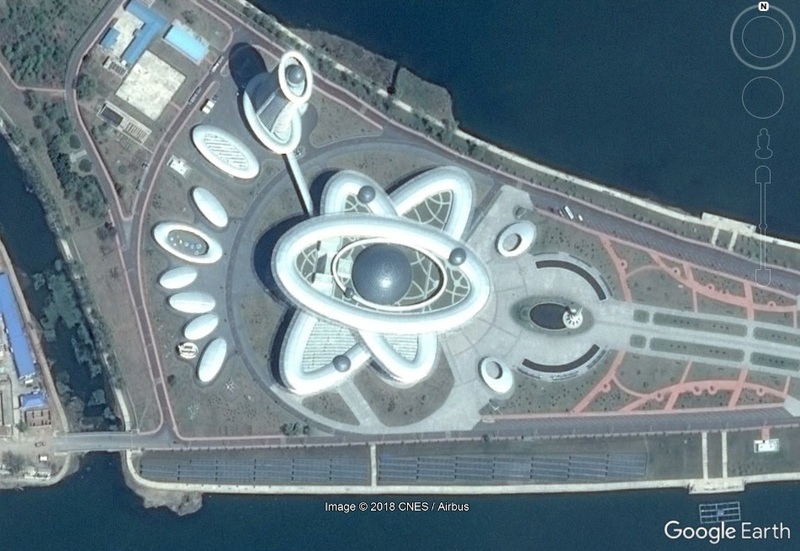 I have to say “probably” because I am only aware of one new Sci-Tech Library in Hamhung, and I cannot say the plan is to build them across the country until I see them in other provinces. 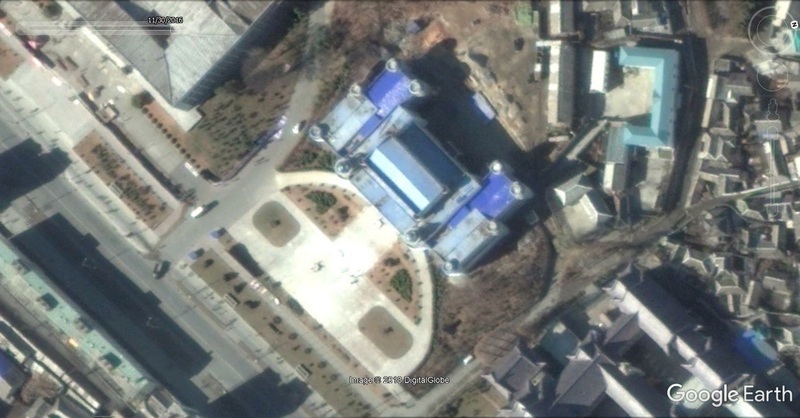 According to Google Earth imagery (see below), the South Hamgyong Sci-Tech Library was built on the site of the former South Hamgyong Cultural Exhibition House sometime between 2016-2-26 (Top) and 2016-11-30 (Bottom). 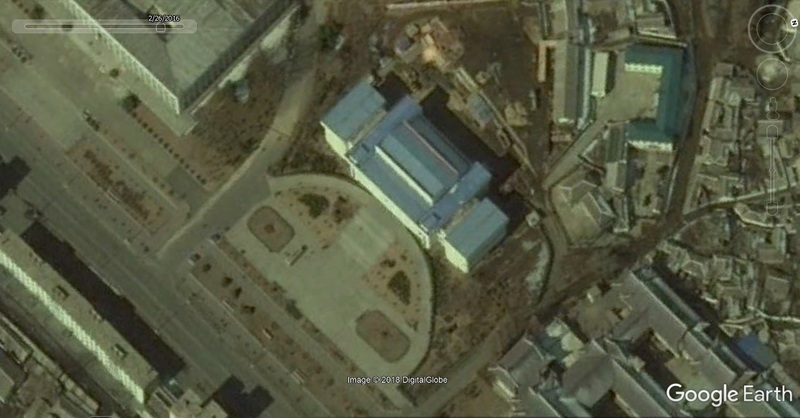 The new building appears to be a mixture of architectural styles seen in Ryomyong and Mirae Scientists Street. 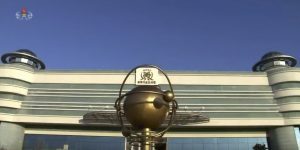 It contains two features resembling stylized hydrogen atoms, or planets with rings, on the roof. There is also a statue of a helium atom (two electrons) in front of the building. 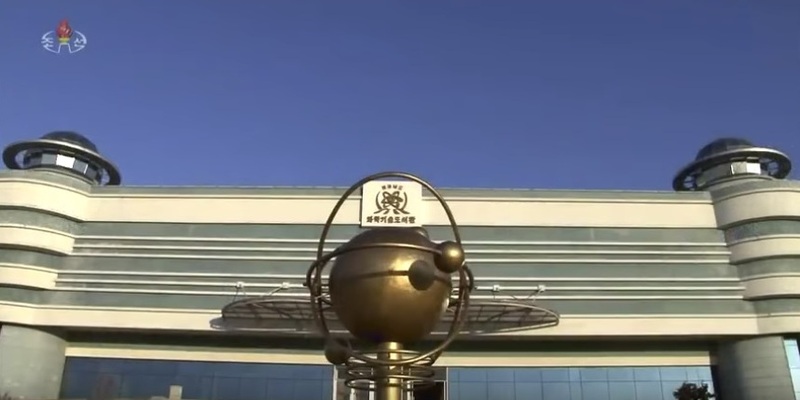 The completion of this facility was not announced in the official media as far as I am aware, so this slipped by me until I stumbled on a broadcast image of a library card that featured the new building. It is possible that this is a unique facility and that it will not be replicated in other parts of the country. 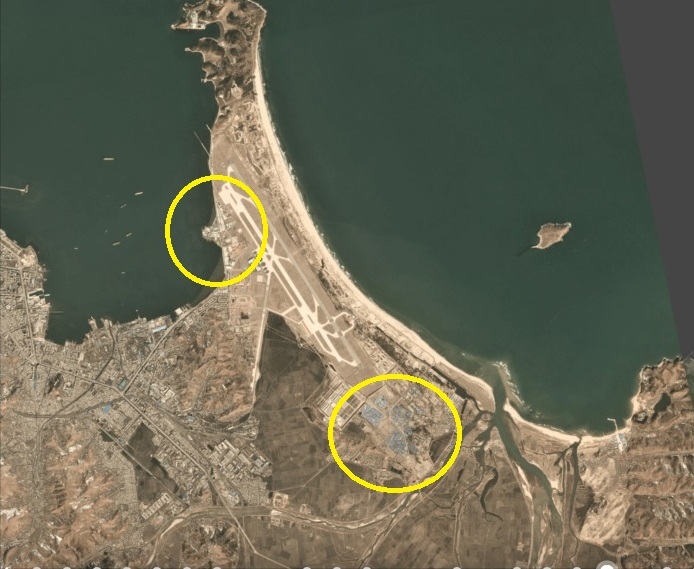 Hamhung has a number of specialized research and production facilities (including the largest branch of the State Academy of Science outside of Pyongyang), and this could be a facility meant to nurture the particular industries of the area. However, it could also be the first Sci-Tech Library at the provincial level, and more are on the way. We will have to wait and see. 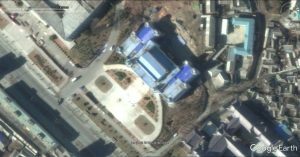 North Korea has been regularly featuring provincial-level “Sci-Tech Exhibitions” in the official media. The Pyongyang exhibitions are held in the Sci-Tech Complex, so perhaps the provincial exhibitions will be held in Sci-Tech Libraries such as these in the future. 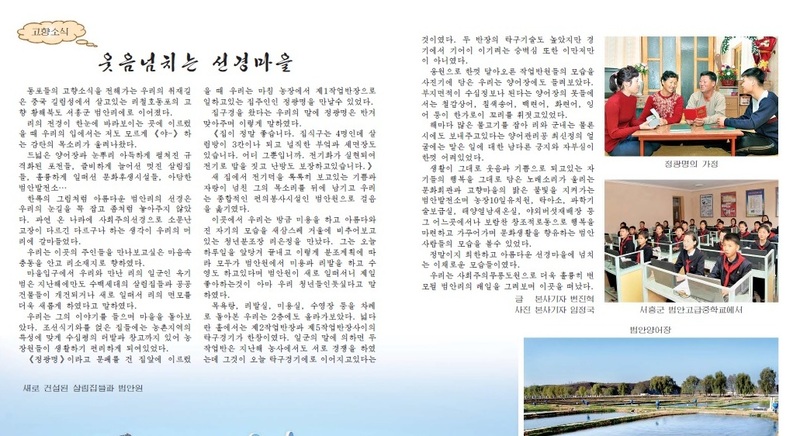 In the most recent issue of Kumsugangsan, the North Koreans highlighted the renovation work of Poman-ri (one of the eight scenic vistas of the songun era). 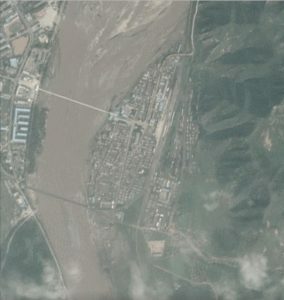 A quick check with the imagery on Planet Labs does indicate that there was a new health complex built (normal at the town level, but only specially allocated at the village level), new apartment buildings constructed, and a school appears to have been renovated (also very common in North Korea these days). 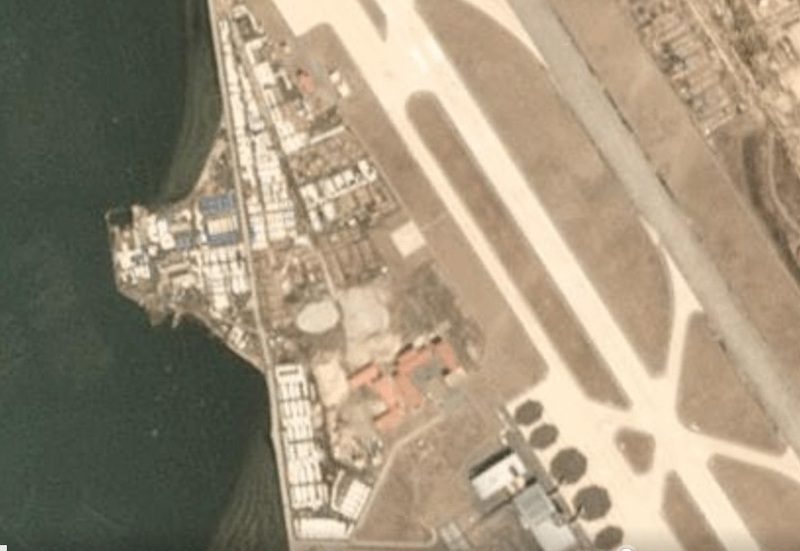 Pictured above (Top): Poman-ri as seen on Google Earth in 2015-8-26 (Bottom): Planet imagery from 2018-2-3 showing renovated area. 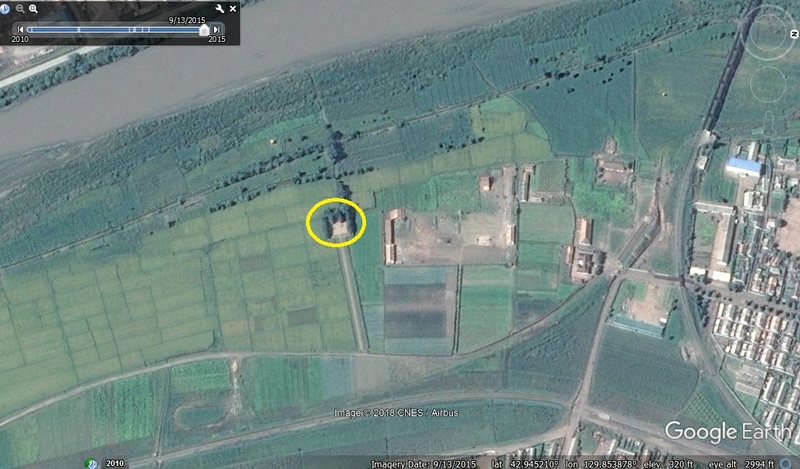 This is not the first farm to be “renovated” in the Kim Jong-un era. 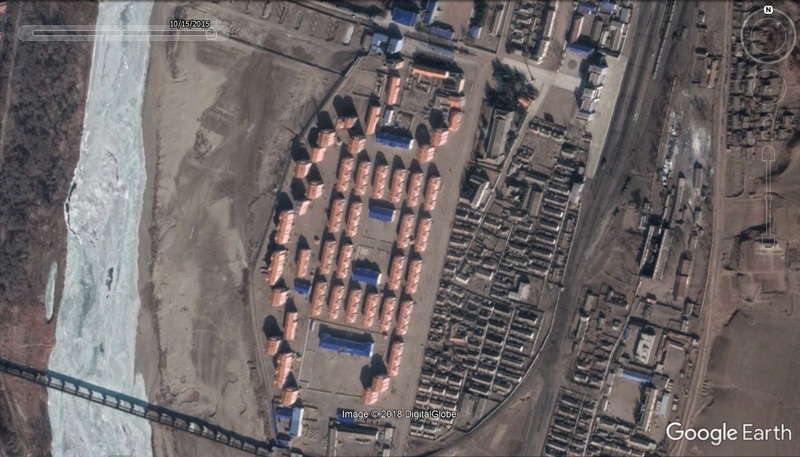 It is also not the largest village to be renovated (so far it appears to be one of the smallest). So what is going on here? 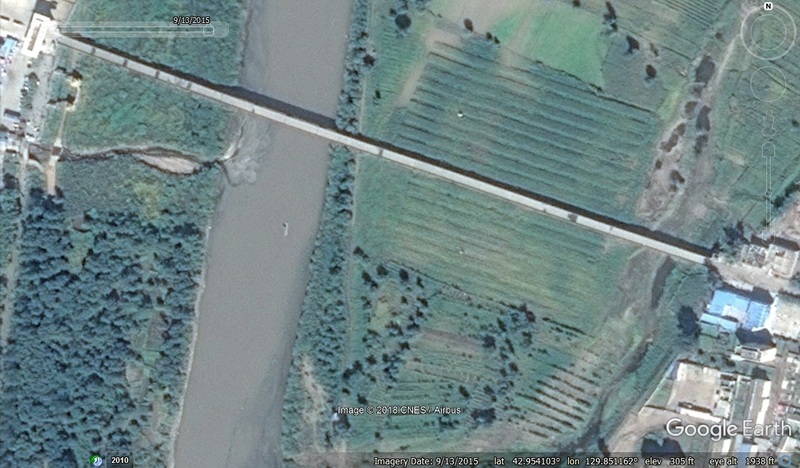 North Korea appears to be in the process of constructing new “model farms” in the KJU era. 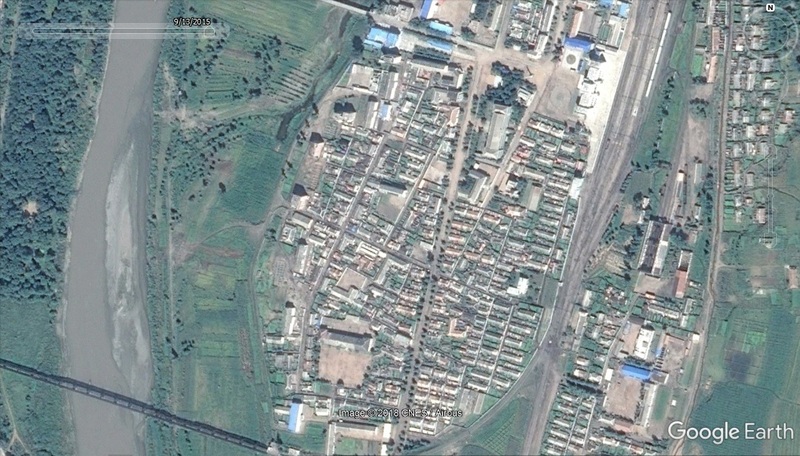 Previous “model farms,” such as Chongsan-ri in Nampho, are primarily associated with revolutionary works of Kim Il-sung or Kim Jong-il. These new farms, however, are intended to spearhead Sci-Tech achievements under Kim Jong-un which can be replicated across the country. 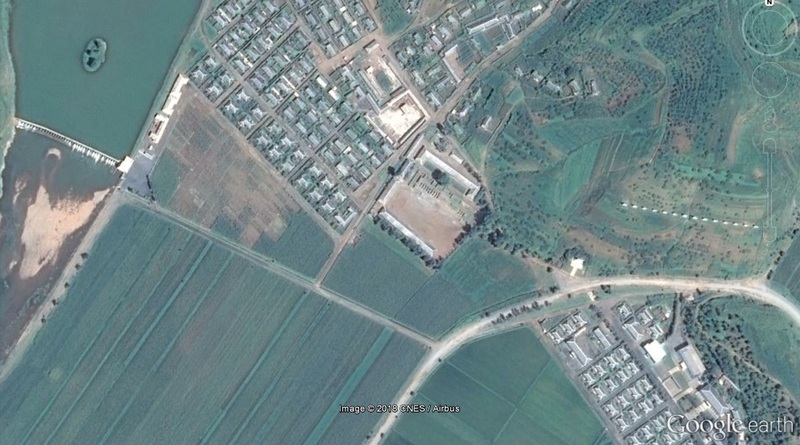 Jangchon-ri (AKA “DPRK-Libya Friendship Jangchon Co-op Farm”) on the outskirts of Pyongyang appears to have been the first of Kim Jong-un’s new model farms. Consequently, it has received the most attention in the official media; it has been visited at least twice by Kim Jong-un; and it receives regular foreign tourists, journalists, and even foreign NGOs. Kim Jong Un, first secretary of the Workers’ Party of Korea, first chairman of the DPRK National Defence Commission and supreme commander of the Korean People’s Army, gave field guidance to the Jangchon Vegetable Co-op Farm in Sadong District, Pyongyang City, whose looks have undergone a radical change to be a model and a standard of the socialist rural cultural construction. He set forth a task to build the farm into an exemplary farm and icon of greenhouse vegetable production when providing field guidance to the farm associated with the immortal history of leadership given by President Kim Il Sung and leader Kim Jong Il in June last year. He guided the layout for the construction of Jangchon area several times and took benevolent measures for settling the issues arising in it. He went round the mosaic depicting smiling Kim Il Sung, a monument to the revolutionary activities of Kim Il Sung and Kim Jong Il, the room for the education in the revolutionary history and the room dedicated to the history of the farm. He recalled that the farm developed into a dependable producer of vegetables under the warm and meticulous care of Kim Il Sung and Kim Jong Il who made indefatigable efforts to the last moments of their lives to provide the Pyongyang citizens with fresh vegetables all the year round. He went round the hall of culture, science and technology disseminating center, Jangchon health complex, modern dwelling houses and other places to learn about the construction in detail. He praised the farm for building the hall of culture as well as a national art theatre so that the farmers may fully enjoy a cultural and emotional life and constructing a nice park and a leisure ground having a volleyball court, a swimming pool, a roller-skate ring and a fishpond. He was satisfied to see the library, e-reading room and technology study room in the science and technology disseminating center and modern equipment in the soil analysis room and the room for examining damage done by insects. Appreciating the successful construction of modern dwelling houses, in particular, he was pleased that the farm carried out the party’s policy of making an effective use of natural energy and turning the village into an orchard by equipping each house with solar water heater, solar cells and a methane gas supply system and planting fruit trees around each house. He went round mud-walled plastic sheet greenhouses and arch-style chain greenhouses to learn in detail about the vegetable production and management of the farm. He enjoyed a bird’s-eye view of the farm from the observation deck. He praised the Pyongyang City for working an eye-opening miracle in the socialist rural cultural construction as required by the party and being able to proudly greet the grand festival in October. He extended thanks in the name of the Party Central Committee to farmers of the farm and officials and other working people in Pyongyang City for making a positive contribution to turning the Jangchon area into a spectacular farm reminiscent of a rural city as required by the party. 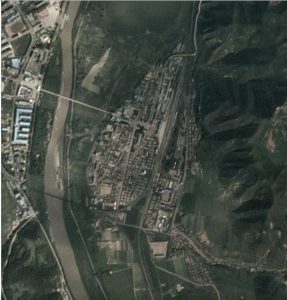 It is the resolution and will of the party to bring about a radical turn in the rural cultural construction with this farm as an example and torch, he said, giving Pyongyang City an instruction to push ahead under a plan with the work to spruce up well the farms on the outskirts of the city on the basis of the successes and experience already gained. He expressed expectation and belief that Pyongyang City would take the lead in the drive to implement the behests of the leaders and uphold the party policies in the future as a political, economic and cultural hub of socialist Korea having the mission to hold aloft the banner of the three revolutions-ideological, technical and cultural. He was accompanied by Hwang Pyong So, Choe Ryong Hae and Ri Jae Il. 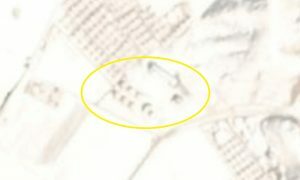 The words in bold above indicate the types of facilities that are to be constructed at all of the new model farms. These types of facilities are already common at the city- and town-level, but still relatively rare at the village level. It would also be interesting to know if this farm (and other similar model farms) operate under different agriculture policies–such as de-facto family plots, or perhaps some flexibility to make agricultural decisions on the spot. Time will tell. 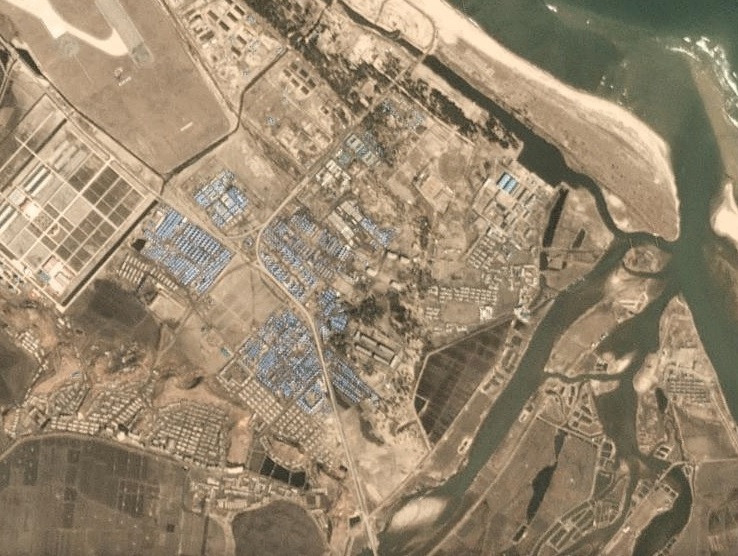 These types of projects are typically rolled out at the provincial level, so other than Jangchon-ri (Pyongyang) and Poman-ri (North Hwanghae), what other model farms can we point to that are being renovated under this policy? 1. Thaesong-ri (Nampho): This farm was featured on KCTV on 2017-9-21, and miraculously it has not been deleted by YouTube). KCTV described the village as a model village with new facilities that are pleasure to live and work in. I have previously mentioned this village in Radio Free Asia. 2. Sokha-ri (North Phyongan): This farm was featured on KCTV on 2018-1-9, but YouTube has since deleted the material. Shame on them. 3. 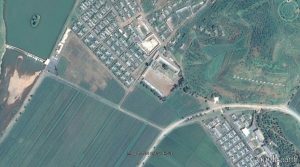 Sinchang-ri (South Hwanghae): This farm was featured on KCTV on 2017-9-20. 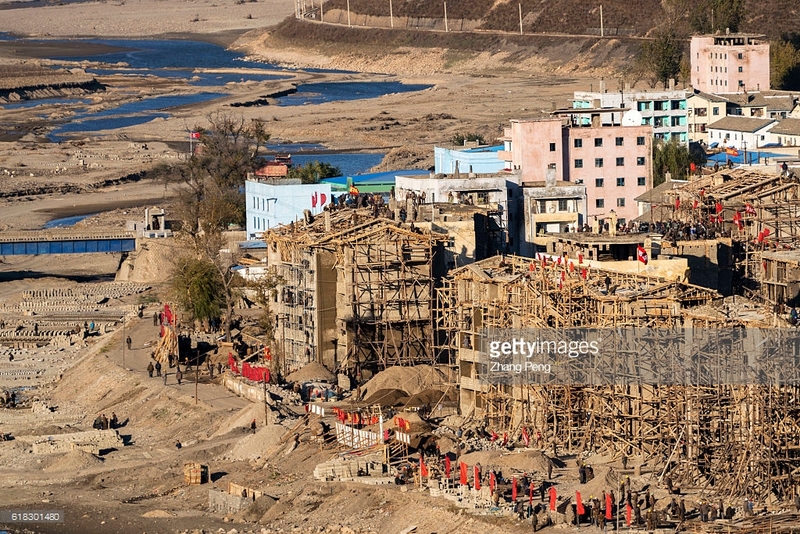 This village has actually undergone at least two rounds of renovations. I believe the first round was done because the village is next to a popular road artery (North Korea has long been cleaning up villages long the main roads). 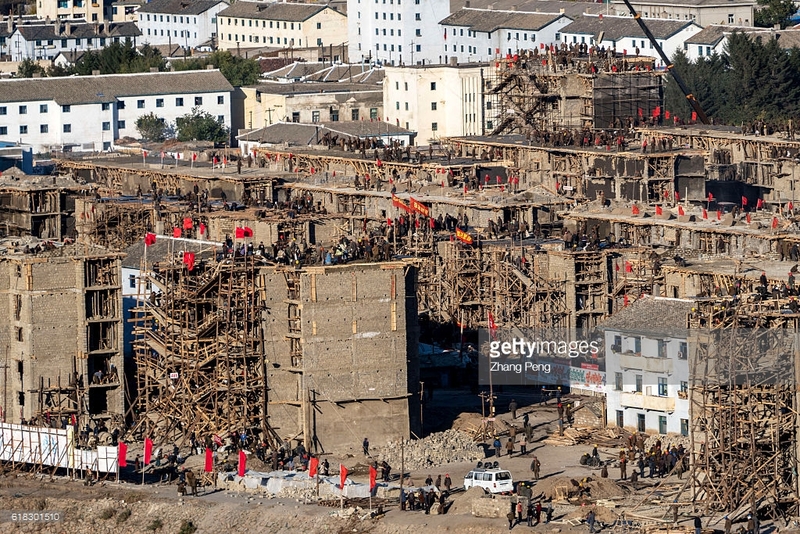 The second round of renovations is due to the new model farm policy under Kim Jong-un. Pictured above (Top): 2006-12-25 (Middle): 2014-3-20–showing completed first renovation (Bottom): 2016-10-23–showing completed second renovation in the new model farm style. 4. Jikha-ri (North Hamgyong): This was also featured on KCTV on 2017-11-5, but has also been deleted by YouTube. I previously pointed it out to RFA on 2016-6-22. Image above (Top): 2015-9-20 (Bottom): 2016-5-7–showing that the village is under renovation. 5. 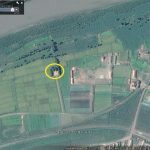 Phyongsu-dong (South Hamgyong): According to imagery on Planet.com, renovation of this farm has been completed, but I have not see it appear in the North Korean media to date. I previously mentioned it in RFA here. 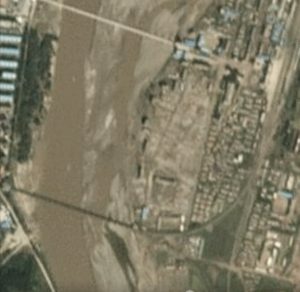 Image dates (Top): 2016-2-26 (Middle): 2017-2-14 (Bottom): Planet image from 2018 showing construction continues to progress. This is not the only village to be renovated in Kangwon. However, I believe it is the only renovation project in the province related to this new series of model farms. 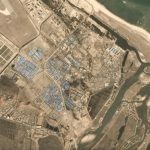 Another village in south Kangwon Province, Thaebek-ri (38.574028°, 127.673046°), has also been renovated in the last few years, and several other farms in Kangwon were renovated as part of the Sepho Tableland Project. Below is the information that remains TBD. 1. 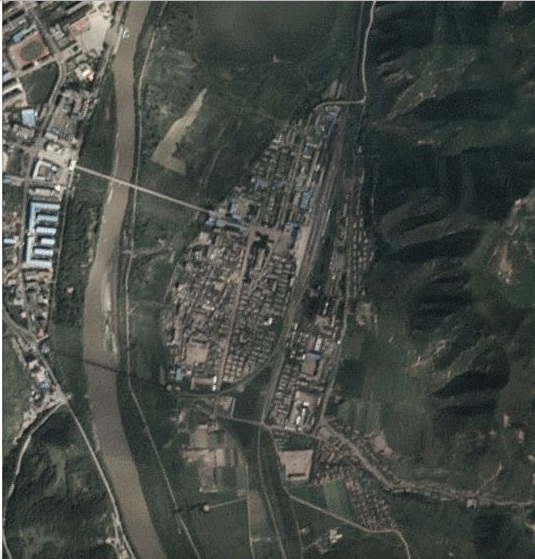 Manbok-dong (Rason): This area in Sonbong was formerly named Paekhak-ri, and it was the site where the North Korean government constructed new housing following floods in the summer of 2015. I could be wrong, but I believe that the post-flood housing is being pragmatically named as the new model farm in the city. However, I could be wrong. 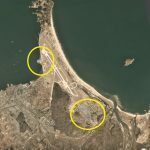 I searched for other village renovation in Rason on Planet Labs imagery and Google Earth, but did not find anything significant. 2. South Phyongan: I am still unsure which village in South Phyongan will be designated as the model farm to be built in this new style. 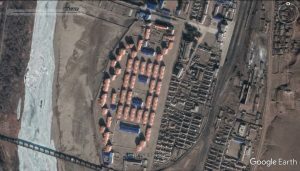 I reported in RFA that lots of housing around Pyongyang Airport was being renovated back in May 2017, some of which is in South Phyongan, but none of these housing projects seem to match the new model farm design. According to a later KCTV report on 2017-11-20 (before it was deleted by Youtube), the Ministry of Coal Mining (석탄공업성), Ministry of Forestry (림업성), National Tourism Bureau (국가관광총국), and the Korea Oceanic Company (조선대양총회사) built new housing in the Pyongyang International Airport District. 1,000 homes were built earlier than scheduled and work was continuing on the remaining houses. However, it is possible that construction on the province’s new model farm has not yet begun in this province. 3. 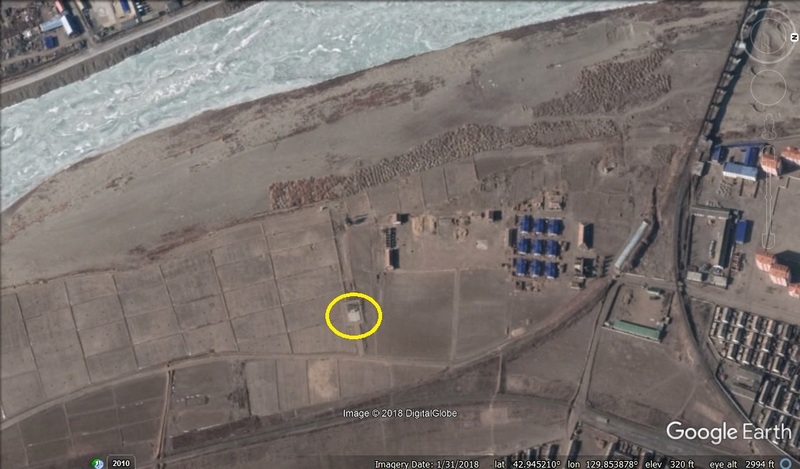 Jagang Province: I have searched the North Korean media, Google Earth imagery, and Planet imagery, but have not seen where construction on a new model farm has begun. 4. 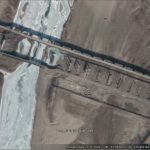 Ryanggang Province: I have searched the North Korean media, Google Earth imagery, and Planet imagery, but have not seen where construction on a new model farm has begun.